I'm looking for a French comic that I 'read' while in France about 25 years ago - I could not read much French at the time, which is why I only have very hazy ideas about the plot. Protagonist was a child who found a spaceship, which was as tiny as a toy. He/she took it home. The ship had some sort of ray-based main weapon, the effects of which where dangerous, so the child effectively had a raygun. The style of the comic was not manga, more in the vein of the usual French/Belgian comics. Language was French, and I would wager the artist was French/Belgian as well. The comic was targeted at children and young adults, I guess. The comic was a short series, with the child having several adventures related to the spaceship-finding and the ensuing drama. 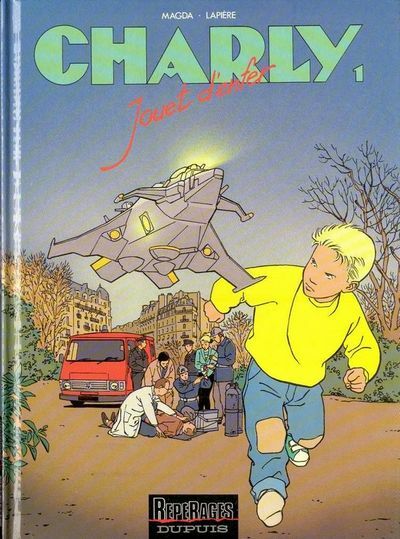 Charly by Belgian authors Magda and Lapière, a French-speaking bande dessinée published between 1991 and 2007. Protagonist was a child who found a spaceship, which was as tiny as a toy. He/she took it home. Charly, a six-years-old, is offered a Cap'tain Foudre (Cap'n Lighting) model rocket by his father. It's quickly revealed that the toy can think and act for itself, and will do anything to please the child's unconscious desires, including murder. The ship had some sort of ray-based main weapon, the effects of which where dangerous, so the child effectively had a raygun. Below is an extract of the first issue, Jouet d'enfer (A toy from hell). 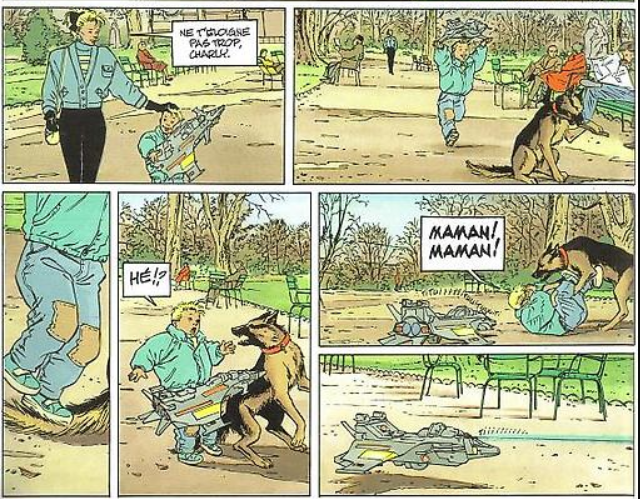 This is the first time we see the toy acting for itself: Charly is playing in a park and a German Shepherd attacks him; the rocket reacts by blasting the dog with the raygun you remembered. The drama you referred to was likely the army going against the toy, since a war weapon should obviously not be handled by a young child. Overall, the series has 13 issues, but it's divided in cycles, not all of them including the toy; only the 4 first issues deal with it, the rest drift a bit. Below is the cover of the first issue, Jouet d'enfer. Found partly by memory, confirmed with the Google query vaisseau jouet site:ederweld.fr since I knew I was likely to have first read about it on this particular site - and indeed, there's a "weekly reading recommendation" about it! Not the answer you're looking for? Browse other questions tagged story-identification comics bandes-dessinees or ask your own question.